11-Sep-2007 -- This was the first visit to this confluence. The hunt for it started out very frustrating. We thought it should be easy to find someone willing to bring us out 11 kilometers and back again. After all it would have been only be a 45 minutes trip on a boat with a reasonably strong engine. But we were unlucky. Sure there were some boats moored at the piers and the riverbank, but in the rare occasion when we met the owner he declined for one or other reason. One of the fisherman did not dare bring us out that far without repairing his navigation equipment first, which would take the better part of a week. We could not persuade him to trust our GPS receiver. Some fisherman we met declined to take us out, they had after all some serious and hard work to do, and hauling in fish makes more money than taking penny less students on pointless tours. We were pointed to the marina where the leisure boats are stored. But most the people there were less than happy to abort their long awaited fishing trips to do some total strangers a favor. We were also told about the “Flower Maru”, a well known excursion boat which is for hire for fishing and day trips. The owner however refused to rent his boat to us. He made very clear that he did not want to have anything to do with foreigners. In our despair we even asked some officers of the Japanese coast guard who did some maintenance and routine work on one of their smallest boats. They were inclined to do us the favor studied our map and asked a lot about our reasons for going to he confluence which we patiently explained. They told they would be happy to do it and we should wait while they would contact their superior on the radio, which they did immediately. After some time of deliberation the answer was, not unexpectedly, no. Our last hope was the most unlikely candidate: the car ferry to Sado Island. Sado is with around 800 square kilometers Japans sixth largest Island. Its role in Japanese history was as an place for exile and gold mining. It has still a strong tradition in the classical Japanese performing arts and a popular destination for summer excursions. The straight line between Sados main harbor and Niigatas Ferry terminal runs very close by the confluence, and we reasoned that there was slim chance that we would pass within the 100m perimeter. We bought ferry tickets, and some snacks, and boarded the ship. Our tension and excitement grew as we approached the confluence. We fixedly stared at the GPS display, camera in hand. Our cheers and cries when we passed the confluence in 60 meters distance at around 30 kmh drew a lot of heads. We almost forgot to take the required pictures. 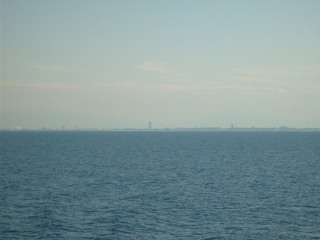 From the confluence both Niigata sprawled at the coastline and Sado is visible. We spent the rest of the 50 kilometers to Sado celebrating. We stayed six hours on Sado, before heading back on the last ferry. We opted for a relaxing day on the beach near the village Mano, enjoying the warm and clear water of the Sea of Japan, and a extended bus trip around the island. After the frustrating search for a boat the unexpected success and the trip to the wonderful island was very rewarding. By the way: I believe this was the first time someone visited a confluence using a 130 meter long car ferry. On the way back we also had our GPS out and indeed passed within 100 meters of the confluence again. I believe that the ferrys use it as an reference point for navigation.